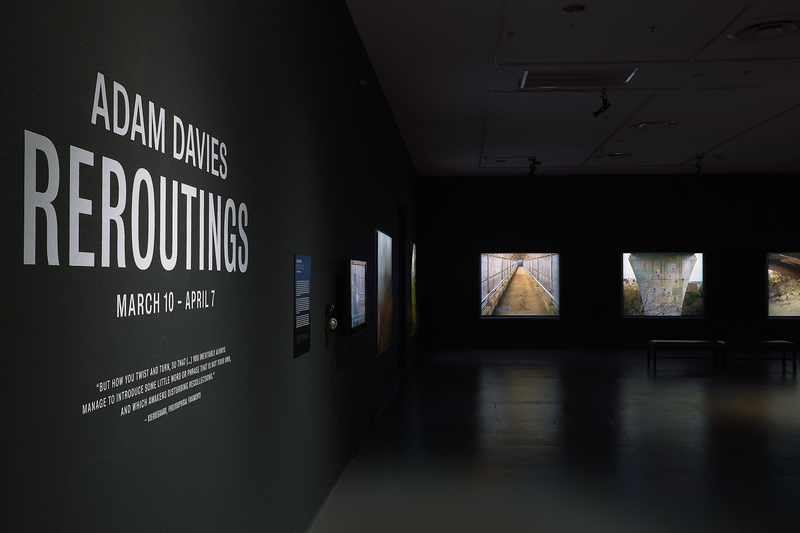 This exhibition represented a culmination of more than two years of research and development, including custom designed lighting and prints of large-scale 5 x 6 foot photographs. The Creative Alliance’s 2000 sq. foot gallery was transformed into a dramatic black box space: it was darkened, the walls were painted black, and spot lights were trained on the individual photographs, giving the impression that they were illuminated from behind. The eﬀect was to create a transformative space within the gallery that encouraged close looking. 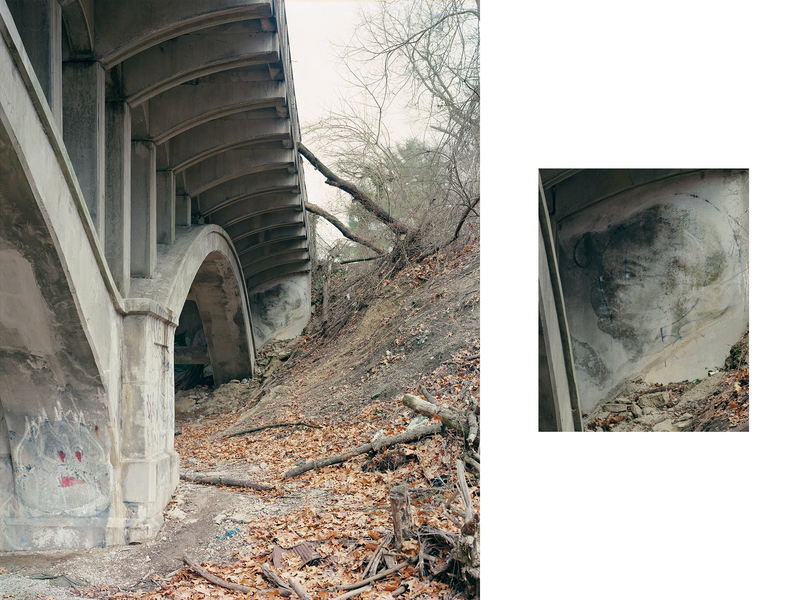 I am a large-format photographer interested in architecture and public spaces; I use these subjects to pose questions about place, identity, materiality, and history. I have long been fascinated by the issue of human engagement with the natural and built environment. 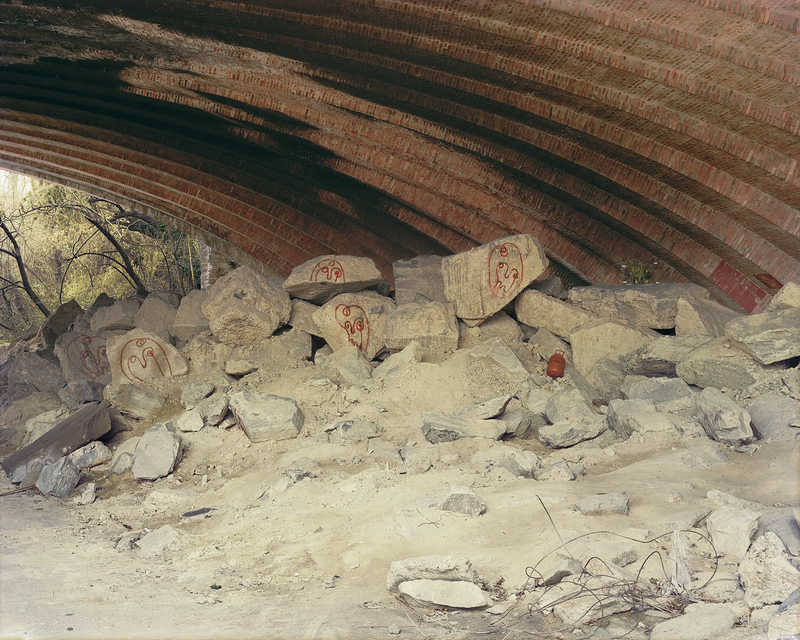 This subject, how we experience our surroundings and, in turn, how we affect them, is of critical importance to my work. By representing the possibilities of a ‘hybrid landscape’ – in which buildings and the surrounding environment are fused – the photographs offer a different perspective on architecture, one that downplays a heroic conquest of nature and looks instead for modes of coexistence with it. My photographs combine traditional and new techniques. The images are taken with an 8 x 10 inch view camera. A common form of equipment for photographers of architecture in the mid-twentieth century, this film camera allows me to move the lens separately from the back of the camera, optically manipulating the perspective, depth-of-field, and angle of focus within each image. Working in this manner is laborious but retains the distinct quality of film, its look and grain structure. My final images possess an extremely high resolution and subtlety, yielding photos that are immersive to the viewer while conveying a physical and tactile sense of the architectural structures and their surrounding spaces. Musicians Alex Zhang Hungtai and Adam Rosenblatt performed separate collaborative pieces (interacting with my photographs) during the exhibition. "Photographers on Photographers," by Ben Marcin, 2018. As a large print, the text within the bag is legible (it is the base of cardboard box that contained a power drill). 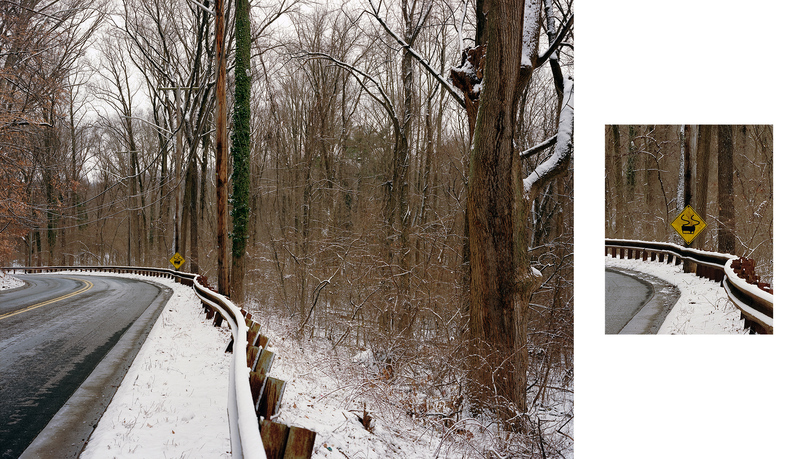 Reroutings examines the layered history of places and the way in which both objects and images can be “read.” Much public infrastructure, particularly in Baltimore and Pittsburgh, is marginalized or neglected. There is a subculture that utilizes these spaces and interacts with the architecture, leaving behind traces of human presence in the process. The photographs reveal discreet graffiti or signs of vandalism that encourage multiple, often contradictory, interpretive possibilities. Are they humorous? Anti-authoritarian? Cries for help? 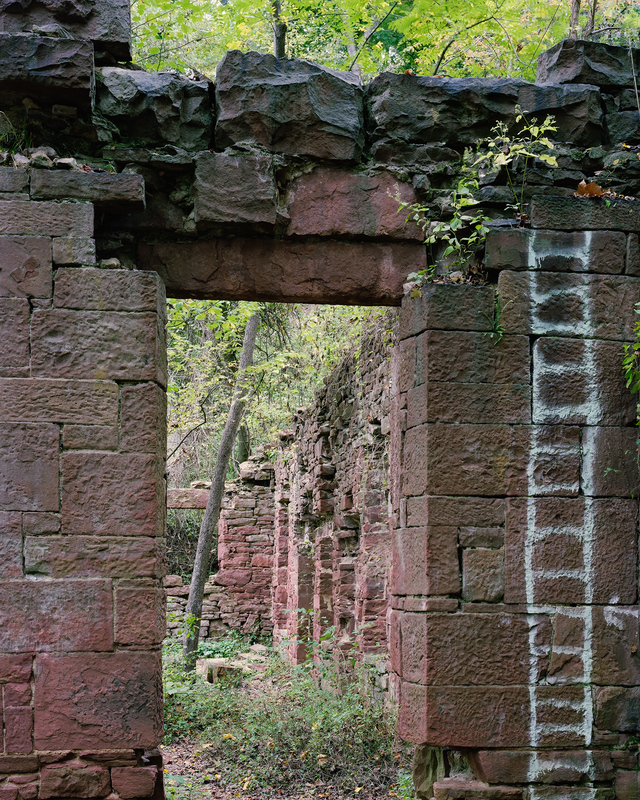 The photographs highlight the funny, political, or tragic tensions between the marks, the structures that act as their visual supports, and the surrounding landscapes. This layered triumvirate of language, structure, and setting hints at a culture that is simultaneously nostalgic and angry, wickedly funny and melancholic. 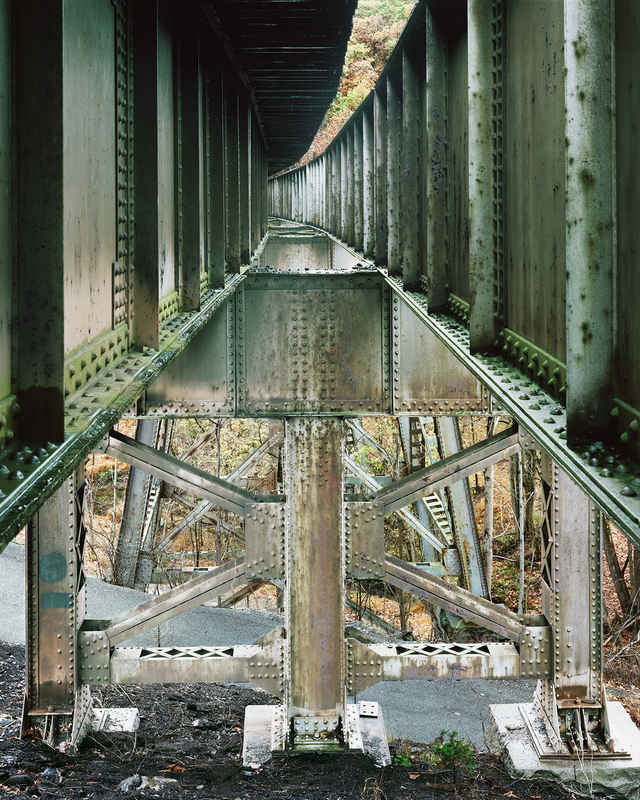 The photographic series Substructures examines the architectural spaces created by the supports (abutments, piers, bents, etc.) of bridges. 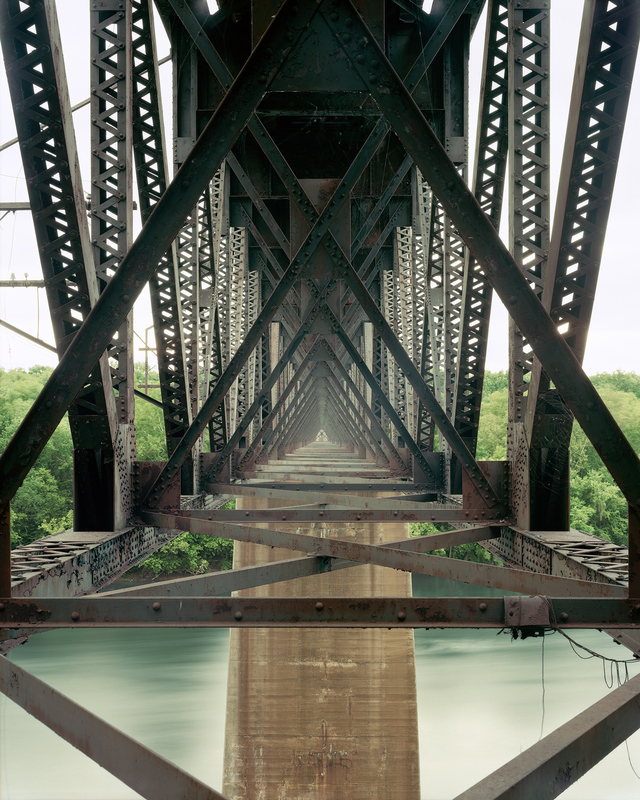 Known technically as substructures, these supporting elements are invisible from the deck of the bridge yet they root it to the ground and ensure that it is able to traverse an otherwise impassible landscape. 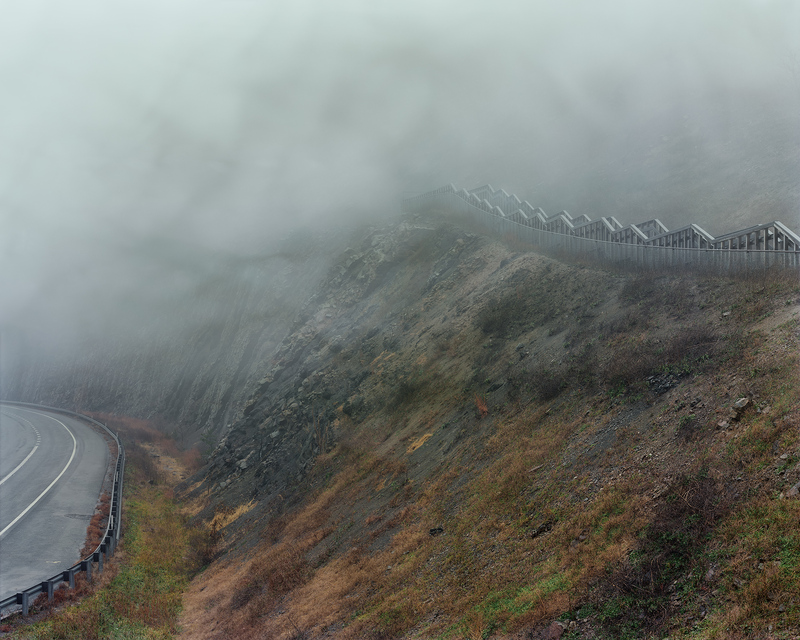 The photographs from the series entitled I Dreamt I Fell From A High Place look at the way in which the natural world obscures, infiltrates, and reinterprets architecture. 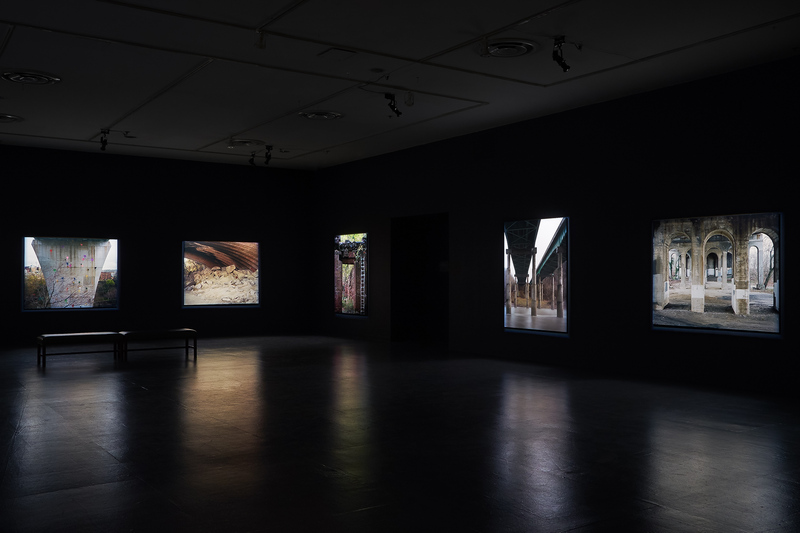 In these photographs, the immaterial – fog, reflections, water, and light – competes with the material— the physicality and weight of concrete, glass, and steel. Within the space of the images, roles are reversed. 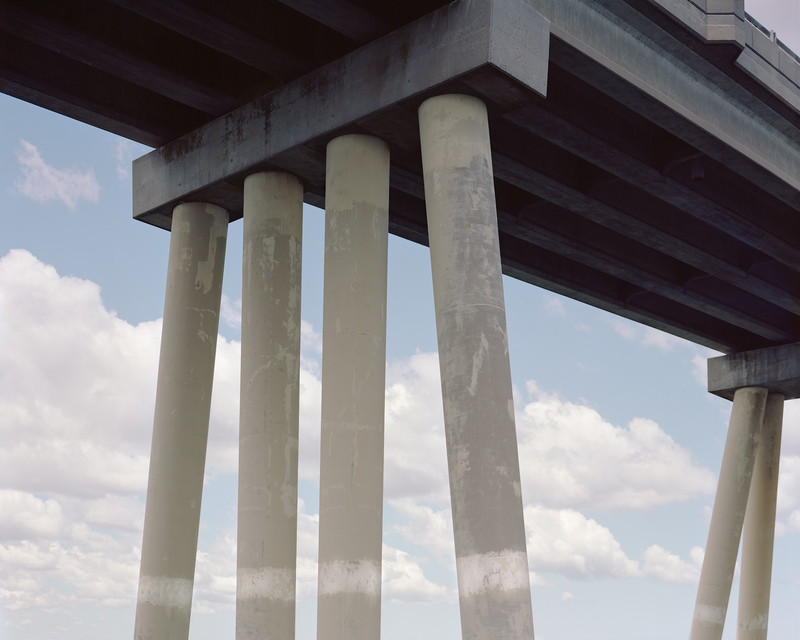 Clouds appear to travel through bridge pylons; steel girders skim across the surface of water. 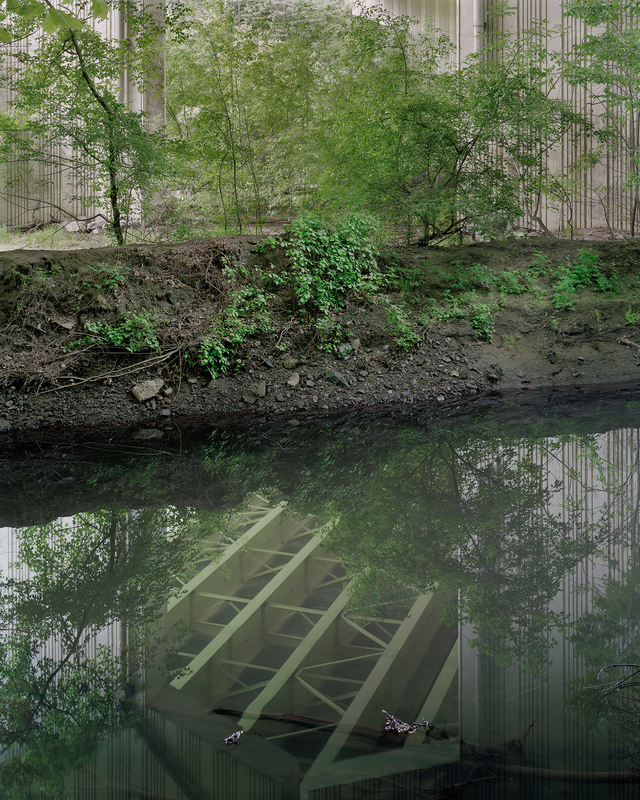 By representing the possibilities of a ‘hybrid landscape’ – in which buildings and landscapes are fused – the photographs offer a different perspective upon architecture, one that downplays a heroic conquest of nature and looks instead for modes of coexistence with it. Between 2012 and 2015, I explored the entire length of the Chesapeake & Ohio Canal — the 184.5 mile waterway that stretches between the DC neighborhood of Georgetown and Cumberland, Maryland. I was interested in the way in which the shared histories of this canal and its competitor, the Baltimore & Ohio Railroad have shaped the landscape in and around Mid-Atlantic region. In the nineteenth century, these companies oversaw two of the most important infrastructural projects in the United States. Fierce rivals in the movement of freight between the DC area and the Great Lakes region, they fought a bitter economic war for land access along the Potomac River. In the process, they completed major building projects (canals, railroads, bridges, dams, tunnels) that physically transformed the nation, connecting disparate areas through commerce and transportation. As fortunes of both companies fell with a succession of crises (financial, natural disaster, civil war), a fraught history unfolded that can still be glimpsed in the structures today. In order to suggest the complexity of the sites – in which successive time periods are literally layered, one over another – I accompanied my images with additional components (written text, historical maps, photographs, and blueprints) drawn from research in state and national archives. The work was designed to be shown as a series of posters.